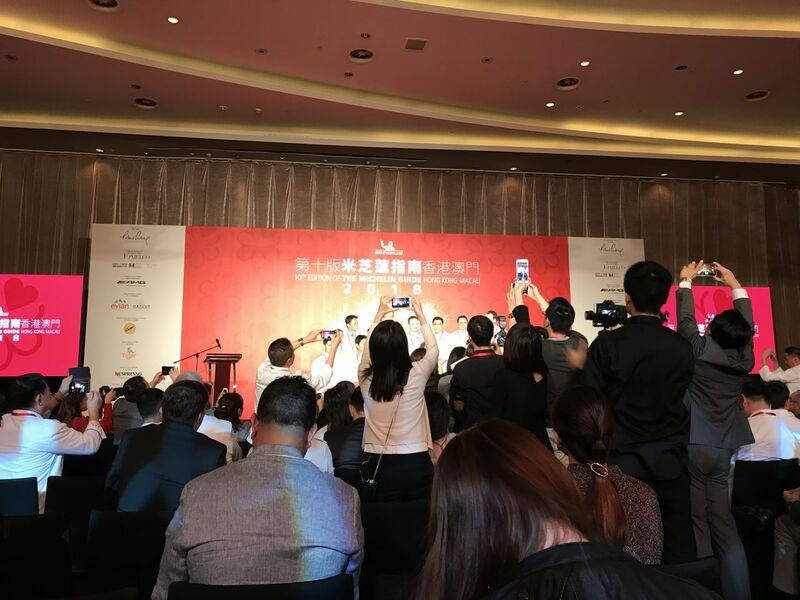 Today was the big day chefs in Hong Kong and Macau have been looking forward to -- the announcement of the Michelin stars. The event was held at the Grand Hyatt Macau at first it was a pretty tame affair when each restaurant was introduced and the chef came up to receive the guide as an award. Afterwards there would be a group photo of all the chefs who all got one star this year, two stars then three. However, that's when the mayhem broke out. People in the audience would start taking pictures with their smartphones, while professional photographers at the back would shout out their frustrations. "Put your phones down!" they exclaimed in Cantonese, much to our amusement, but some wouldn't listen and the demand was repeated over and over, more exasperated each time. The climax was when all the chefs were invited on stage and getting that giant group shot is near impossible as you can see from the picture above.